Trivalley Electronics sells computers with upgraded configurations. If the computer has modifications (listed above), then the manufacturer box is opened for it to be tested and inspected and to install the upgrades to achieve the specifications as advertised. If no modifications are listed, the item is unopened and untested. Defects & blemishes are significantly reduced by our in depth inspection & testing. 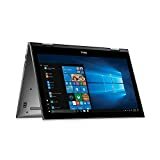 Inspiron 15 5579 with High End Features Comes with a Full HD display so you can enjoy beautiful views on a sizable 15" screen, perfect for projects or streaming. Equipped with a touch screen to easily manipulate app and objects directly on screen. Picture It Your Inspiron comes with a built-in infrared camera. It pairs with Windows Hello for easy login without a password, for added security and convenience.